Here at Baylor, our Energy Champions team is educating us about how to be more environmentally friendly. In light of Earth Day, we wanted to pass along some of their great advice. Feel free to leave your tips in the comments below. The U.S. Environmental Protection Agency estimates that about 380 billion plastic bags, sacks and wraps are used each year in this country. Yet the evolution of plastic bags into the preferred choice for most supermarket shoppers is a great curiosity: they accommodate relatively few items; pile up at home faster than new ideas can be invented for them; and have a tendency to blow away, making them a prevalent source of litter. These reasons alone would prompt most people to try something else, and about 20 percent of shoppers do ask for paper, but paper and plastic both have environmental impacts that provide compelling reasons to abstain from using either. 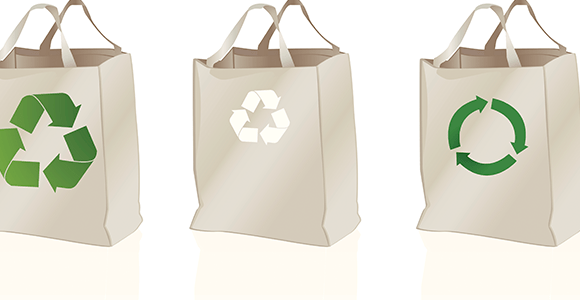 Plastic bags are made from non-renewable petroleum resources and require the use of toxic chemicals during production and processing. Plastics production produces 14 percent of toxic air emissions in the United States, and each plant emits an average of 300-500 gallons of contaminated waste water per minute. As plastic bags move through their life-cycle, they continue to menace the environment. Very few facilities collect and recycle plastic bags, and they end up primarily as litter or landfill material. Paper has its problems too: Every year nearly 1 billion trees are cut down to provide raw materials for American paper and pulp mills. Contributing to this figure is the 10 billion brown paper grocery bags used annually in supermarkets across the country requiring virgin fibers to give them the strength to hold heavy groceries. Pulp and paper mills are also among the worst polluters of air, water and land of any manufacturing industry in the country. Plastic and paper bags are not only less desirable from an environmental standpoint; they are also functionally inferior to stronger reusable carriers. The smart and resource-wise choice is to use durable cloth carriers, preferably ones made from organically grown fibers, for everyday shopping. Significant environmental harm and a portion of our waste stream would disappear if everyone started using cloth bags in place of paper or plastic. This is an easy and practical daily choice, and the hardest part is remembering to take cloth bags with you to the store. Keep an eye on the city of Austin as a bellwether for the rest of the state. Starting in March, all retailers are now required to do away with thin, single-use shopping bags, whether plastic or paper. Seems the winner of the two has turned out to be fabric. Use durable fabric bags and take them on all your shopping trips, not just to grocery stores – and be sure to keep a set in your vehicle at all times. When buying plastic containers, try to buy those that are labeled with a 1 or 2 within the chasing arrows symbol; these two types of plastic are widely recycled. Put larger produce items (e.g., oranges and peppers) directly into the grocery cart instead of using the small plastic bags provided. Wash out soiled plastic food storage bags and containers to get a few more uses out of them (wash two at a time like gloves, inside out – and simply wash your hands). This post was authored by Ira Nicodemus, Energy Engineer for CB Richard Ellis and a member of the Energy Champions team at Baylor Health Care System.